Instant messaging has been part of our today’s culture. It was short messaging service (SMS) that has been simplified our lives by offering a way to communicate in relatively more affordable tariff than phone call. The innovation does not stop there as multimedia messaging service (MMS) was introduced. By using MMS, people can send richer media as they can insert image and/or sound as well as the text. Furthermore, the development of technology lead us into instant messaging service as the more fun, richer, and engaging way to communicate. Up to right now, numbers of instant messaging platforms have been used by Indonesian, and LINE was no exception. The Japan-Korea instant messaging application has been successfully adopted by Indonesian as it reaches more than 30 million users up to the end of 2014. The popularity of LINE even attracts brand and celebrity to create their official account to be able to interactively communicate with their public. Understanding this phenomenon, we conduct a survey aimed to describe Indonesian LINE users’ habit on accessing the application. 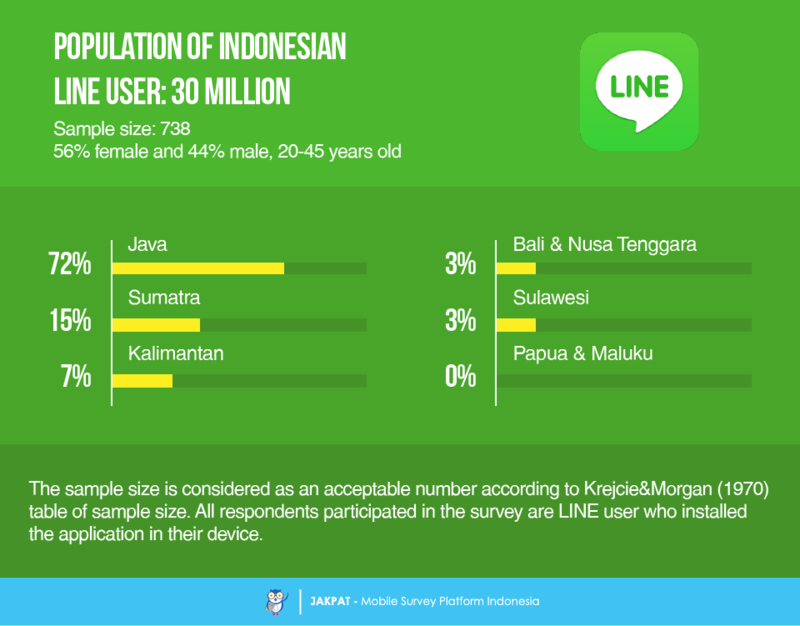 The general population of this survey is the total number of LINE user in Indonesia. Approximately, up to two years ago the number of LINE user in Indonesia reach 30 million. According to the table of sample size proposed by Krejcie and Morgan (1970), 738 as the number of our sample is considered as an acceptable number. The proposition of our sample respondents are 56% female and 44% male during the age range of 20-45 years old. All respondents participated in the survey are LINE user who installed the application in their device. Our survey was conducted in nationwide. The geographical proposition of our respondents were Java (72%), Sumatera (15%), Kalimantan (7%), Bali&Nusa Tenggara (3%), Sulawesi (3%), but unfortunately we could not receive any feedback from our panel of respondent in Papua and Maluku. Among all respondents participated in the survey, 86% of them are actively access their account on regular basis. However, men and women tend to show different pattern on their access habit. 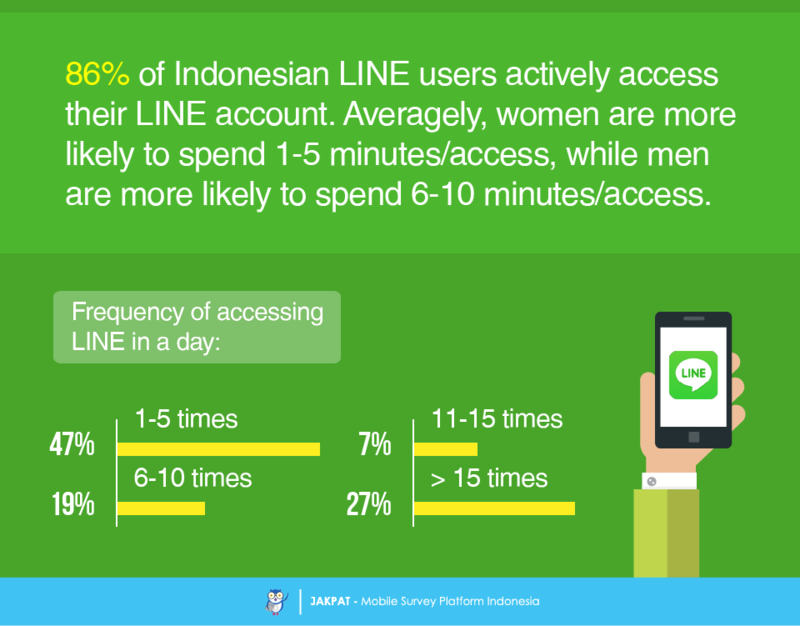 Women are more likely to spend lesser time than men to access LINE. Women are more likely to spend only 1-5 minutes per access, while men spend 6-10 minutes per access. The access duration maybe low, but the frequency of accessing LINE is remaining high. Interestingly, we find two extreme points from the result. At one point, most respondents access LINE from 1 to 5 times a day, while the lesser respondents access LINE more than 15 times a day. We try to further discover respondents’ motivation of using LINE than other applications. We find different reasons between men and women as explained on the infographic below. Six top reasons were mentioned by respondents. Men’s motivation on using LINE are dominantly caused by three factors; LINE offers free call and video call feature, LINE has better and faster connection, and their friends are on the LINE. Moreover, other reasons are LINE offers attractive stickers, offer promotional program, and it has timeline feature to share any information. Similar reasons were also mentioned by our women respondents. 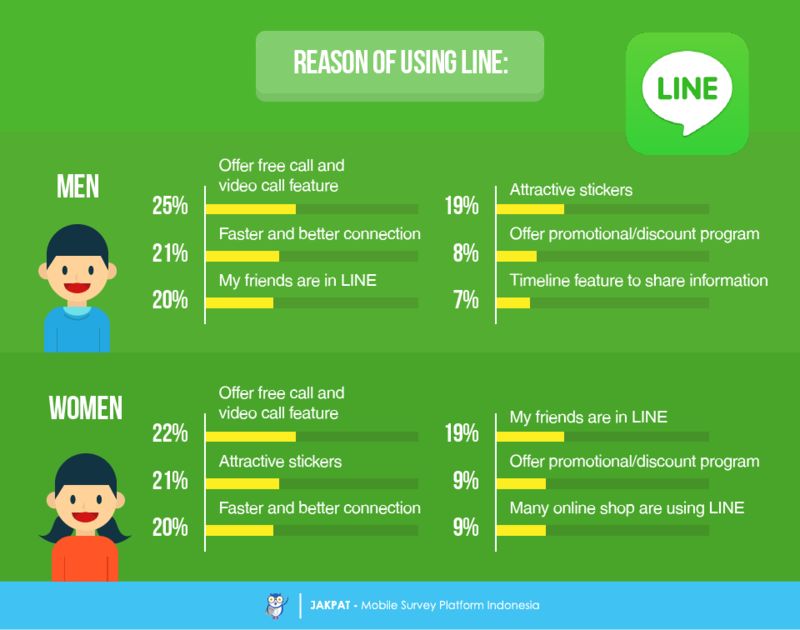 Given the same list of motives as the men respondents, our women respondents said that LINE offers free call and video call feature, attractive stickers, and better as well as faster connection. These reasons then followed by their friends are on the LINE and it offers promotional program. What make our women and men respondents differ in answer are their last motives. If men are attracted to LINE due to the timeline feature, women are attracted to LINE since many online shops are using LINE to communicate with their customer. 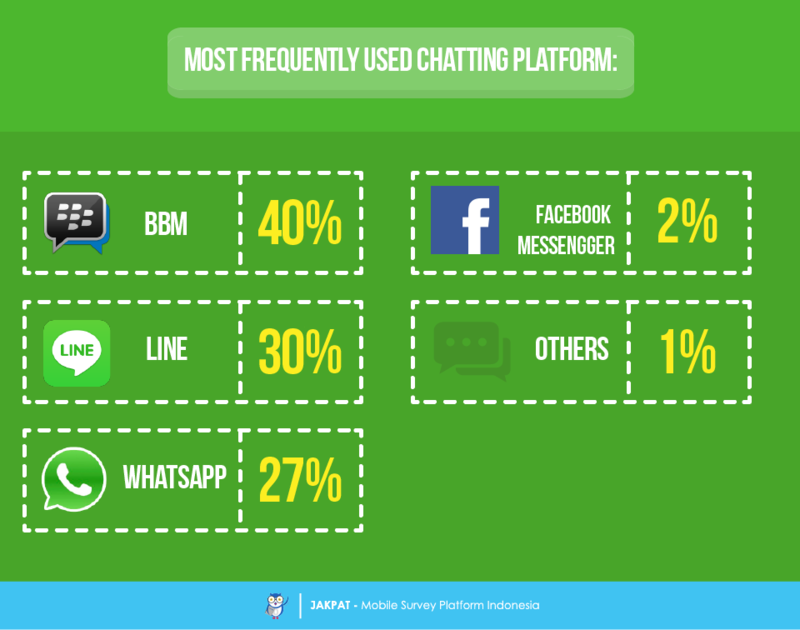 Comparing LINE with other instant messaging platform, LINE stay at the second most frequently used platform among others. The first position is BlackBerry Messenger, followed by LINE, WhatsApp, Facebook Messenger, and others. 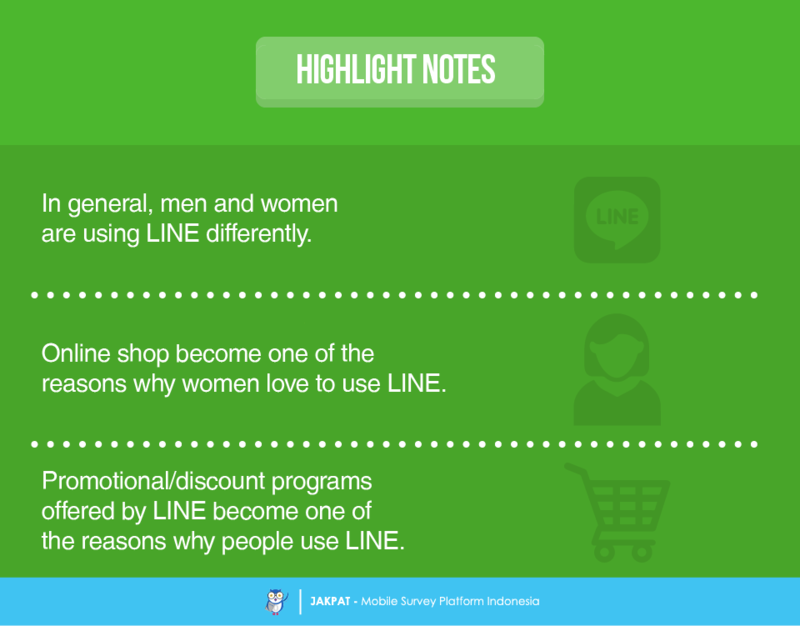 We compile several facts about Indonesian LINE user as listed below. At first, as LINE is a popular instant messaging platform among nations, numbers of brand are trying to bet their luck by creating their official LINE account. 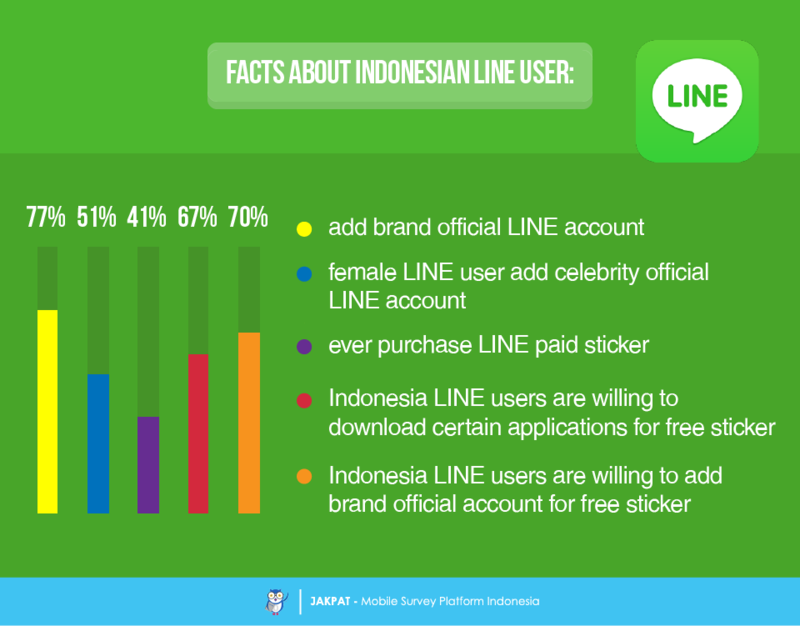 77% Indonesian LINE user served as respondents in this survey said that they are adding brands’ official LINE account. Second, compared to men, 51% female LINE user add celebrities’ official LINE account. Third, regarding to the paid sticker offered by LINE, only 41% of respondents ever had the experience of buying the stickers. Fourth, as there are commonly conditions applied to be able to download particular sticker such as user is required to download certain application or adding certain official account, we asked whether they would like to do the requirements. Interestingly, 67% Indonesia LINE users are willing to download certain applications for free stickers, and 70% Indonesia LINE users are willing to add brands’ official account. 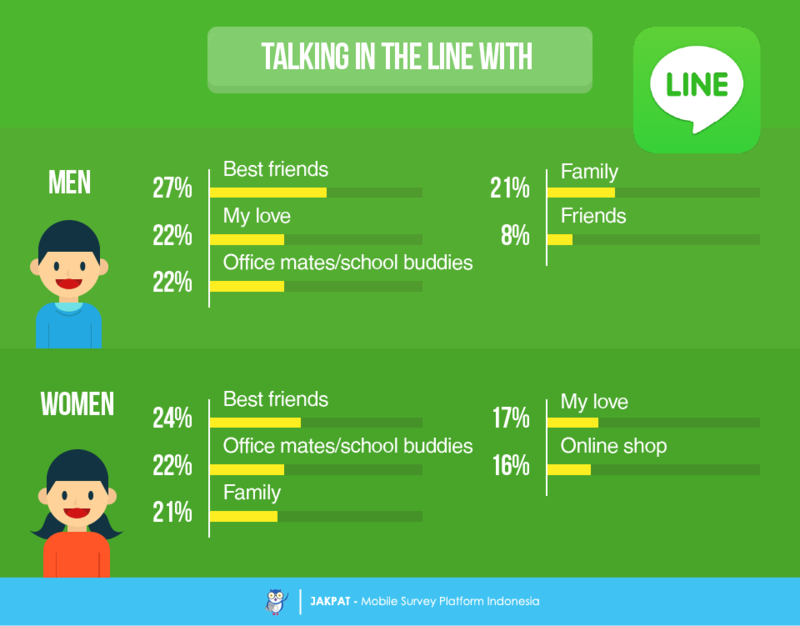 To expand our insight about LINE user, we also asked our respondents to mention whom they talk in the LINE. Apparently, men and women have different person to talk with by using the application. Men are more likely to talk with his best friends, his loved one (girlfriend /wife), office mates/school buddies, family, and friends. However, women are more likely to talk with her best friend, office mates/school buddies, family, her loved one (boyfriend/husband), and online shop. As timeline feature has been a specific characteristic of LINE application, we asked whether our respondents ever use the feature. 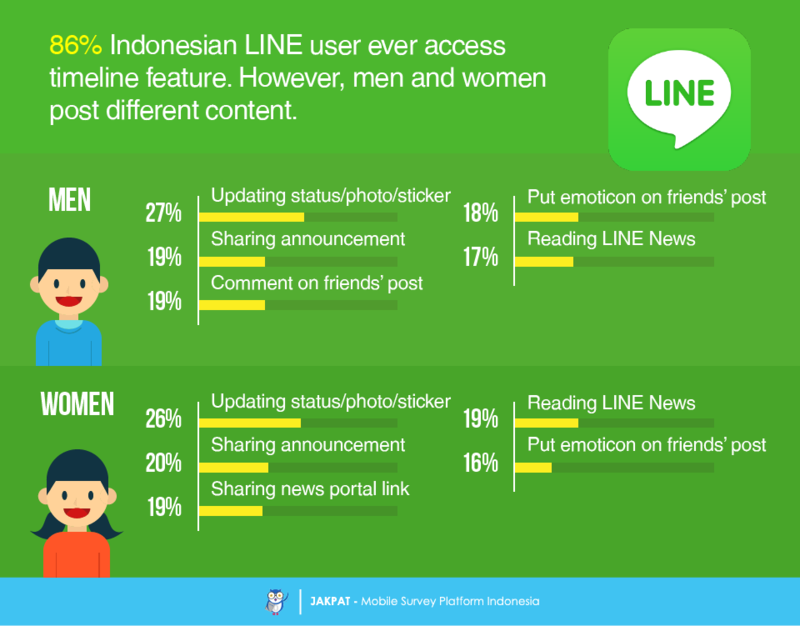 Interestingly, 86% of Indonesian LINE user ever access timeline feature. However, there are different kind of contents posted by men and women. Men are more likely to post any photo, sticker, or update his status at the first place. This finding then followed by sharing announcement, comment on his friends’ post, put emoticon on his friends’ post, and reading LINE news. In other hand, women are more likely to post any photo, sticker, or update her status as well. However, they also share announcement, share news portal link, reading LINE news, and put emoticon on her friends’ post. LINE is an interesting application since it is not only providing us with instant messaging platform, but also additional applications. Apparently, many users are attracted to the additional applications although the kinds of application they download are quite different between men and women. 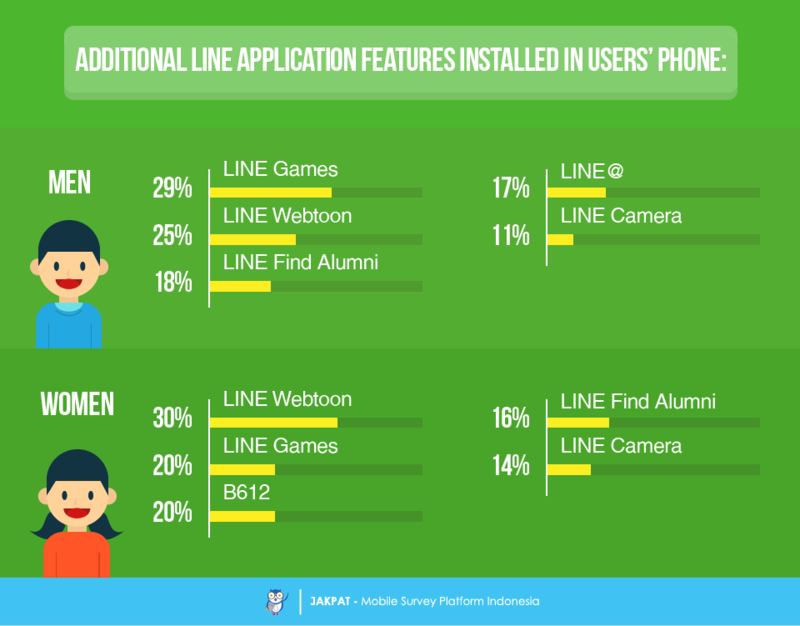 Men are more likely to download LINE Games, LINE Webtoon, LINE Find Alumni, LINE@, and LINE Camera. Women are more likely to download LINE Webtoon, LINE Games, B612, LINE Find Alumni, and LINE Camera. At last, among all additional applications offered by LINE, LINE games is remarkably considered as the most noticeable. LINE games have been very popular since the very first time LINE was introduced. Comparing both sexes, male LINE users are more likely to install LINE games than women. 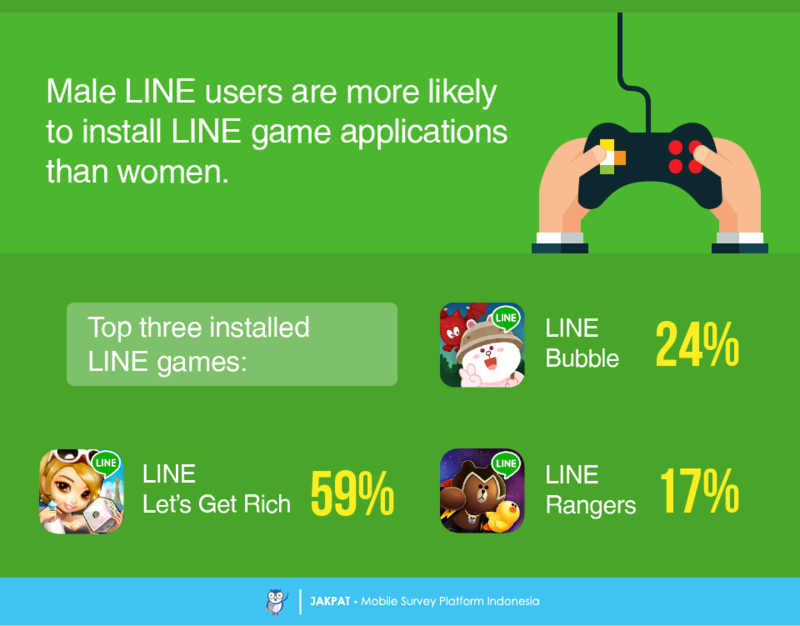 Last but not least, the top three installed LINE games among respondents are LINE Let’s Get Rich, LINE Bubble, and LINE Rangers. For more detail you can download XLS report at the button below (bahasa). JAKPAT report consists of 3 parts which are 1) Respondent Profile, 2) Crosstabulation for each question and 3) Raw Data. Respondent profile shows you demographic profiles ( gender,age range, location by province, and monthly spending). Cross tabulation enables you to define different demographic segment preference on each answer. This entry was posted in Mobile on April 19, 2016 by Syaifa Tania.